At Versalift UK we are serious about your safety. Training improves safety, increases productivity, enhances awareness and fulfills your legal obligation for the operation of a MEWP. Our qualified instructors ensure that your staff experience quality training, direct from the platform manufacturer. Training can be given here on site using our latest facilities or at your own premises, providing you meet the requirements of providing a classroom and the use of a suitably certified vehicle for the duration of the course. 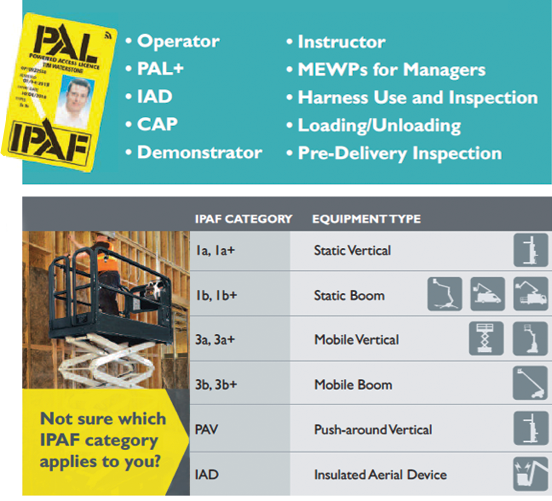 As an IPAF accredited training centre Versalift provides operator training courses for the IPAF Powered Access License (PAL card). Valid for five years, this is the most widely held and recognised proof of training for platform operators. The PAL Card (Powered Access Licence) conforms to the international standard ISO 18878. PAL+ is an optional, additional one day of category- specific training aimed at operators working in higher risk or challenging environments. This course instructs an operator to prepare and safely operate an insulated platform. This course provides guidance for platform engineers on compliance with regulatory requirements and to offer documented evidence that individuals can be regarded as competent persons to plan, manage or carry out thorough examinations of powered access equipment. This course trains a demonstrator to familiarise operators with their responsibilities and demonstrate pre-operational and safe operating procedures and the limitations of MEWPs. This pre-delivery inspection course enables trainees to perform PDIs of MEWPs in a structured and systematic way. With Versalift Training Direct you’re in safe hands!